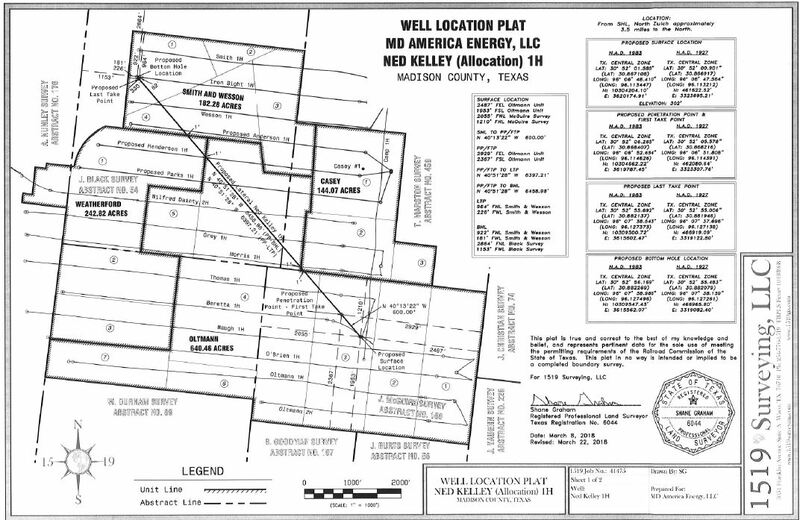 Here is a permit plat for a new MD America Well in Madison County. All wells shown, including the new well, are in the MadisonVille, W. (Woodbine -A-) Field. Every well but two on the plat is an allocation well. Click on image to enlarge. Our firm filed a similar suit a few years ago on behalf of the Klotzman family challenging an allocation well permitted by EOG. EOG and the Klotzmans settled their dispute shortly after they appealed the RRC’s grant of EOG’s permit. For my discussions of the Klotzman case, search for “Klotzman” in this site’s search engine. A client recently asked me whether he should sign a production sharing agreement. I replied that this is not an easy question to answer. Allocation Well. A horizontal well drilled across two or more lease lines without creating a pooled unit including the leases. Because no provision of the leases dictates how production will be shared among the leases, production must be “allocated” among the leases. Three recent articles have intensified the debate over whether allocation wells are authorized by a typical oil and gas lease. Two of the articles appear in the most recent edition of the Section Report of the Oil, Gas & Energy Resources Law Section of the State Bar. The first, written by Ernest E. Smith, makes clear in its title the position of the author: Applying Familiar Concepts to New Technology: Under the Traditional Oil and Gas Lease, a Lessee Does not Need Pooling Authority to Drill a Horizontal Well that Crosses Lease Lines. View here: Applying Familiar Concepts A later version of his article will be published in the Texas Journal of Oil, Gas and Energy Law at the University of Texas School of Law. The second article is by Ronald D. Nickum, an oil and gas attorney in Amarillo, titled Non Consent Allocation – Will it Survive Judicial Scrutiny. View here: Non Consent Allocation Mr. Nickum’s article is more skeptical about the legality of allocation wells. Professor Smith’s article is written in rebuttal to an article to be published in the Baylor Law Review written by Professor Bret Wells, Allocation Wells, Unauthorized Pooling, and the Lessor’s Remedies, which can be viewed here. Professor Wells argues that allocation wells are a form of pooling not authorized by a typical oil and gas lease and give rise to claims for trespass and punitive damages. The Texas Railroad Commission ruled in the Klotzman case that it had the authority to issue permits to drill horizontal wells that cross multiple lease lines without pooling those leases together. Although the Commission has never adopted a rule defining or authorizing permits for such wells, an “allocation well” has generally come to be understood as a well that crosses one or more lease lines and that produces from more than one lease without pooling those leases and without any agreement with the royalty owners as to how production will be allocated among the leases crossed by the well. Because of the uncertainty as to the legality of allocation wells, exploration companies sought legislation in the last legislative session expressly authorizing such wells. That bill, HB 1552, died in committee. It is expected that similar legislation will be filed in the upcoming session. Division Orders- How Do I Know My Decimal Interest is Right? So you have received a division order, and it says that ABC Oil Company will pay you for a .015625 royalty interest in the Barn Burner Unit #1 Well. How do you know whether the .015625 interest is correct? I’ve written previously about the purpose and legal effect of division orders, and you can read that post here. The purpose of a division order is to protect the company paying the royalty (“payor”) from double liability. If you sign a division order and it turns out that you should have been paid a larger interest than shown on the division order, the company is protected as long as it paid according to the division order. If you sign a division order and it turns out that your interest is less than the interest shown on the division order, you are legally obligated to pay back the money that you weren’t entitled to. A payor is legally entitled to require that you sign a division order correctly setting forth your interest as a condition to payment. Mike McElroy of the Austin firm McElroy, Sullivan, Miller, Weber & Olmstead, has written an article in the Section Report of the Oil, Gas & Energy Resources Law (Spring 2014), titled “Production Allocation: Looking for a Basis for Discrimination,” defending the practice of oil and gas operators’ drilling of “allocation wells.” The term “allocation well” has come to be used by staff at the Texas Railroad Commission and by the industry to refer to a horizontal well that is drilled across lease lines without pooling the tracts on which the well is located. Mike argues that the RRC has authority to issue allocation well permits and that a standard oil and gas lease, with or without a pooling clause, authorizes the lessee to drill allocation wells. This firm represented the complaining party in the Klotzman case, in which we argued that the RRC has no authority to issue allocation well permits and that the drilling of an allocation well violates the terms of a typical oil and gas lease unless the lease expressly grants such authority. So, below is a rebuttal to some of the points made by Mike McElroy in his article. Mike says that “Lessors and their lawyers see horizontal drilling and production allocation as opportunities to amend (re-trade) old leases.” The question that must be asked is, does the lease authorize the lessee to drill an allocation well? If the answer is no, then the lessee must obtain an amendment of the lease to drill the well. The lessor may bargain for consideration in exchange for granting the lessee the right to drill the well. If the answer is yes, as Mike argues, then the lessee needs no agreement from the lessor to drill the well.